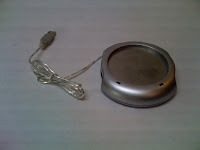 I have one combination USB Hub/Coffee Cup Warmer to give away to the first respondent. You can keep your coffee/tea warm while keeping up to four USB peripherals connected. This comes straight from the mean streets of Hong Kong. I will take your USB hotplate and cherish it always. Just kidding, I'm out of ports on my computer ever since I bought that USB toaster oven/fan combo.